Support your cat for his nine lives and beyond with our MedalSeries Senior Cat Recipe! This tasty recipe features protein sources like Turkey and Alaska Pollock, and pairs them with wholesome ingredients like red and green lentils to keep your cat’s spirit youthful for years to come! With 75% of protein coming from animal sources, this recipe is sure to deliver the high-quality protein your little carnivore craves in every bite to help him thrive in his golden years. Also featuring the addition of L-Carnitine to aid in the metabolism of fats as a fuel source, our senior recipe will deliver the nutrition your senior cat needs to stay vibrant and healthy for years to come — because when you have nine lives, making sure that you’re appropriately fueled for the adventures ahead is essential! 75% of protein from animal sources. Deboned Turkey, Chicken Meal, Turkey Meal, Yellow Peas, Green Lentils, Chicken Fat (preserved with Mixed Tocopherols & Citric Acid), Pollock, Red Lentils, Salmon Meal, Miscanthus Grass, Natural Flavor, Dried Kelp, Flaxseed, Salmon Oil, Choline Chloride, Dried Chicory Root, DL-Methionine, Dried Cranberries, Dried Sweet Potatoes, Calcium Carbonate, Vitamin E Supplement, Yucca Schidigera Extract, Taurine, L-Carnitine, Zinc Proteinate, Zinc Sulfate, Iron Proteinate, L-Ascorbyl-2-Polyphosphate (source of Vitamin C), Niacin Supplement, Ferrous Sulfate, Copper Proteinate, Copper Sulfate, Vitamin A Supplement, Manganese Proteinate, Thiamine Mononitrate, Calcium Pantothenate, Riboflavin Supplement, Pyridoxine Hydrochloride, Manganous Oxide, Biotin, Dried Bacillus coagulans Fermentation Product, Vitamin B12 Supplement, Vitamin D3 Supplement, Folic Acid, Sodium Selenite, Calcium Iodate, Rosemary Extract. 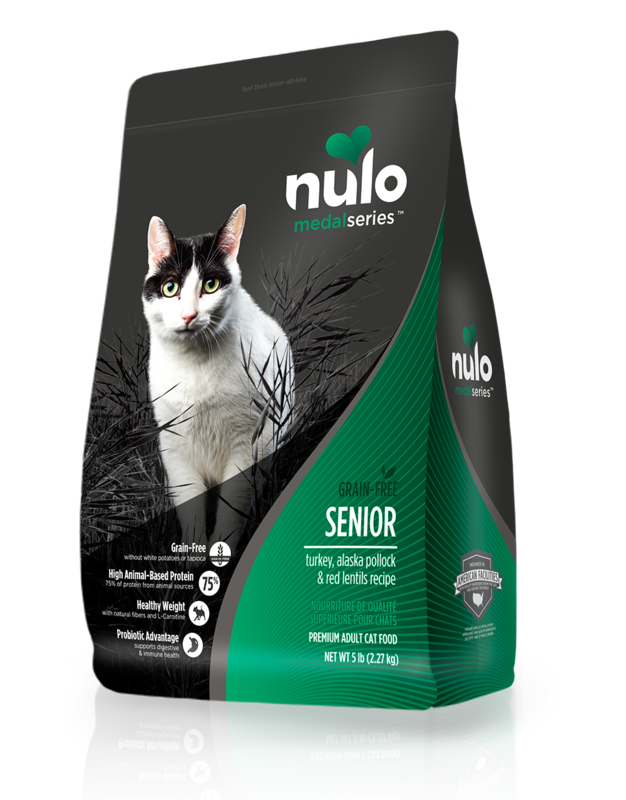 MedalSeries Cat Senior Turkey, Alaska Pollock & Red Lentils Recipe is formulated to meet the nutritional levels established by the AAFCO Cat Food Nutrient Profiles for all life stages.